Get this – he couldn’t play hockey worth a "darn" but Fran Tanner, in recognition of his popularity and contribution to hockey, the South Peace Hockey League (SPHL) dedicated the Most Valuable Player (MVP) award in his honor. 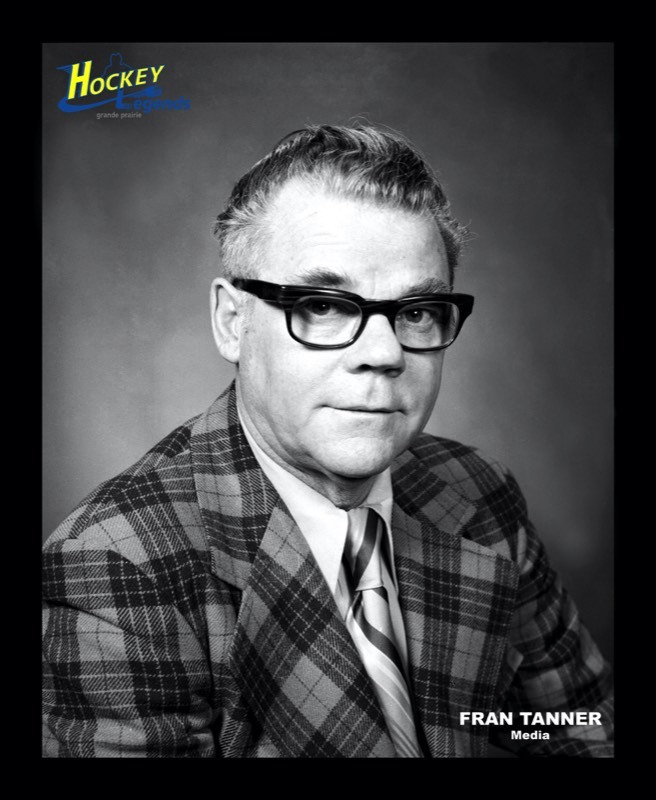 Undoubtedly, Fran Tanner was the most widely known sports personality in the Peace River country during his era. For more than fifteen years from 1960 until the mid seventies Fran Tanner was “Foster Hewitt” to hockey fans in Grande Prairie and surrounding districts. It was audio only but his play-by-play of local hockey on a Saturday night was a broadcast not to be missed for countless fans unable to attend the games. One of his friends and admirers once tested Fran’s sense of humor by reporting that he could watch the third period of a hockey game at the Memorial Arena and on the way home catch Fran’s play-by-play of the last period on his car radio. It was the same friend who was convinced that the thermos Fran carried into the frigid confines of the “gondola” before every hockey game contained something more than tea or coffee. The mystery deepened as time passed but in the end no newsworthy story was found in the thermos. If samplers of the contents can be trusted - it was tea. In the late 20s Fran’s family moved to Grande Prairie from Mazanod Saskatchewan. The old Wapiti Arena, where his father prepared ice for the Grande Prairie Curling Club, was as familiar to Fran as school but much more fun. Little did he know that the rink was his vocational training ground. During the Depression recreational opportunities were limited and equipment was scarce and ragged. Nonetheless hockey was played during the winter wherever a patch of ice could be found. That’s where Fran learned about the game. For young men of Fran’s generation careers were thwarted by WW11. At the outset of the war, Fran enlisted in the South Alberta Regiment serving his country in NW Europe as a radio operator. Fran returned to Grande Prairie after the war where his interest in hockey was rekindled. During his first winter home following the war, Fran was hired by his pre-war buddy, Billy Bessent to help make ice and operate the arena. Fran was back in a setting that was an important part of his childhood. Without a Zamboni, making ice was a painstaking, delicate process and Billy reports that every day was an adventure with Fran as an employee. He did not have a future as an ice-maker. For a brief time Fran played senior hockey in the South Peace Hockey League (SPHL) with the Grande Prairie Key Club; a service organization. He was nursed along by fellow veterans and prewar buddies Roy Wright, Charlie Turner, Bob Card, and Max Henning but he would not make his mark as a player. Parenthetically, their goal tender was Herb Shields, a local figure skater who performed in the net on figure skates. In 1952 Fran became a CFGP staff member as a transmitter operator but quickly moved to sports broadcasting. That’s where he spent most of his career and he must have pinched himself every day he went to work. He found his niche. Cold and primitive as it was, Fran was proud of his Arena Press Box Office. It was an extension of his childhood playground and he was paid to perform there. On long winter nights for almost two decades Fran shared the on-ice exploits of local hockey heroes. His responsibilities included announcing the play-by-play, providing game analysis and conducting interviews. His popularity as a sports broadcaster bears witness to the value that the public placed on the service he provided. As for the different Grande Prairie hockey arenas in which performed - they were a connecting thread throughout Fran’s life. He was the first media personality to be recognized as a Grande Prairie Hockey Legend. It was the winter of 1968 and game night for the fourth match of the South Peace Hockey League championship series featuring the Grande Prairie Athletics versus the Hythe Mustangs. Triple the population of Hythe was packed into the barn and with a win Hythe would have a stranglehold on the series by a 3 – 1 margin. The Grande Prairie Herald and radio, transmitted by CFGP were the principal communication vehicles not just for sports reporting but news in general. TV was an emerging technology and while NHL games were telecast in the Peace River country, local hockey was not covered until Major Junior Hockey came to Grande Prairie. Small wonder that Fran Tanner was such a celebrity. Fran’s clear voice is captured in a taped segment of the game recorded by Darlene Repka whose late brother George played with the Athletics. Eventually a copy of the tape found its way into Stan Neufeld’s collection of hockey memorabilia. Hythe won the game and eventually the series. While Fran covered the series by radio, Stan Neufeld and Ken Nelson of the Herald Tribune provided detailed descriptions of the series in their sports column. In the aftermath of the hard fought series Stan Neufeld quoted the A’s manager and Hockey Legend Roy Borstad “There was no shame in losing to the Mustang’s who ended a fourteen year drought.” The following link is Fran providing a play-by- play of game four. Fran Tanner - a Grande Prairie Hockey Legend in 2006.